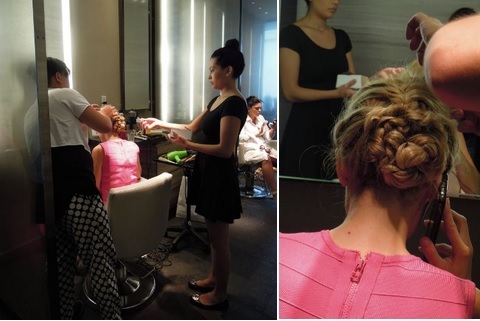 Revlon Professional stylists were on hand at the Four Seasons Toronto Spa last week getting everyone TIFF Red Carpet ready with an arsenal of Revlon Style Masters products! With my short hair there wasn't much they could do for me except make it look sleek and shiny (much needed and appreciated) so I thought this elaborate braided updo they were working on for another lady would be a lot more fun to admire! The hairdresser looked at my fine hair and immediately recommended that I use Revlon Professional Style Masters Volume Shampoo & Conditioner to help pump up my locks which made me feel super smart since I had already recommended it for myself here! Of course it's not a red carpet look without great looking nails which I got thanks to CND National Artist, Tony and CND Vinylux! How much do you love CND Vinylux Weekly Polish in Indigo Frock from their latest collection - an amazing slate blue that is perfect for fall! I've had it on my nails for a week now without a single chip which makes it double amazing!